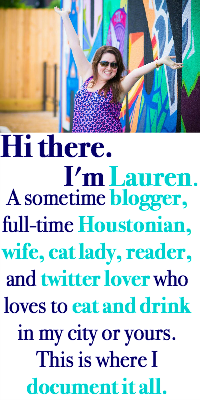 Eat, Drink, and Be Lauren: what's new? Come sit next to me on the less moderate, if people get pissed, they get pissed couch. Setting yourself on fire to keep others warm is prohibited. Nice to see you in this space! Real people are for me people. Our building is currently being renovated and since we have to clear everything out of the bathroom and kitchen I'm trying to get rid of stuff in the process. One nice thing about Switzerland is people will put things outside in a box labelled "Free" and anyone can take it - I have taken books from such boxes before. I did that and most of the things went. It's nice that other people are now using them instead of them being taken to landfill (or in the case of Basel, waste is actually burnt!). I drove by a Dirt Cheap the other day & REAllY wanted to go in. I had to tell myself that I'm moving in a couple of months & more stuff means more packing. Amen to 2013 blogging. The good old days. I find it's helpful to move every once in awhile and then you're forced to take stock of the unnecessary belongings lol. To be honest, my strategy is: Where will I put it? How will I use it?. That's what I ask myself when I want to buy something. With a baby, it's reallllllly tough and I often can't decide on things because, technically, you could buy anything and everything and they'll never know/care/miss it. Scott usually asks "Will it help him?" and so now that's what I ask myself when I'm looking at baby stuff. Also, I totally have a therapist. It's necessary right now. oh i haven't seen that queer eye episode but clearly i need to because i feel like it would really hit me as well. i've gotten better about how i treat myself, but it's easy to slide back into old habits. i am so bad about daily gratitude, i keep meaning to do it and i've only ever heard good things from people who do it, but lazy. maybe next month i'll make it a goal. so true about marie kondo, she didn't buy it for us. every time i get rid of a bunch of stuff i think how did i accumulate so much? clearly i'm not paying attention to what i'm bringing into my house and that is so frustrating. i don't judge or care about all the bloggers out there wanting to make money or be influencers, but i don't have the mental energy for them anymore. i want to be friends with real people, i want to know about their lives and thoughts. sure, they can tell me they bought something or got something for free, but that's not what i'm here for. so yay real people. OMG THIS! Exactly. i don't judge or care about all the bloggers out there wanting to make money or be influencers, but i don't have the mental energy for them anymore. i want to be friends with real people, i want to know about their lives and thoughts. sure, they can tell me they bought something or got something for free, but that's not what i'm here for." I hear that people who watch Queer Eye end up in tears. Definitely my kind of show. I hate stuff so much lately. I am insanely particular about anything I bring into my home these days and when I buy clothing I search for at least one thing to get rid of. I seriously cannot relate to the consumerism that seems to drive blogging and social media these days. I don't have the money or the space for all that shopping.